Prepare to be wowed as you step onto the red carpet of this cozy, swanky joint. 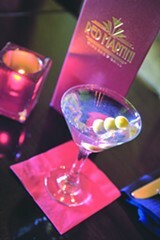 With a feel of something out of the roaring '20s, Red Martini features a red velvet interior, signature cocktails, and outstanding creative edibles, as well as a professional wait staff. All in historic downtown Redmond, which is emerging as a destination all its own.